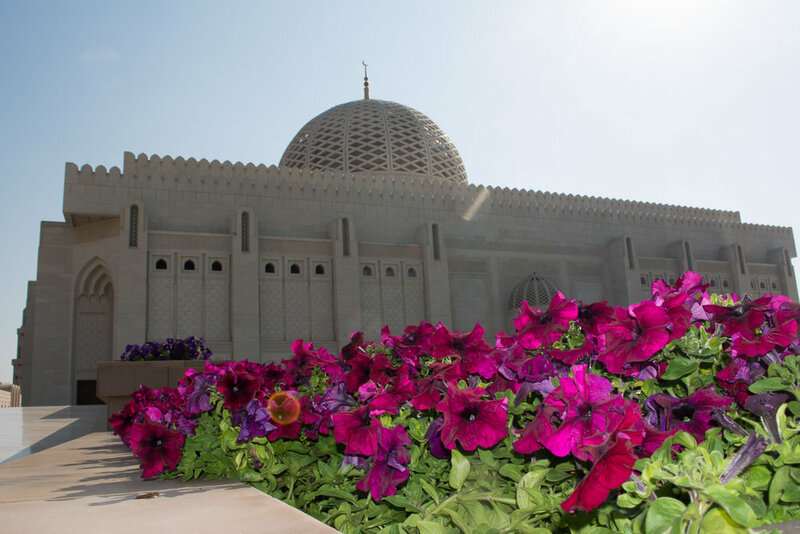 I sat on a bench in the Information Center of the Sultan Qaboos Grand Mosque, in Muscat, Oman. I gazed into the eyes of the woman assisting me. She had been patient while answering my questions about her religion. However, I feared that my next question would be intrusive. I was about to ask her about terrorism. Curious about Islam, I had stopped by the mosque and toured its main room with its Santorini colored dome with sparkling chandeliers. My scarf-wrapped hair had become soaked with sweat as I photographed the floral gardens, read inscriptions along the gray marbled walkways, and then stopped in the Information Center. Why, at this moment, had my mind conjured thoughts of current events, teary vigils and limbs left behind by suicide bombers? It had been a year since my partner had accepted a new assignment, I had quit my job, and we had moved to Oman. Experience had taught me that controversial topics were only whispered about in private circles. As I sipped my water, I wondered if I would be asked to leave. Would she defend the violence? My curiosity outweighed my concerns, so I said, “Tell me about terrorism.” Her initial response was “Terrorists aren’t true Muslims…they are manipulating the Koran.” Didn’t she have anything valuable to add? hissed my inner-voice. Keep smiling, be polite, it added. I was disappointed by comments that had struck me as clichés. Then she honed in on her position of the often solo-minded Western view. “You think it’s all about you,” she said. I felt nauseous; my head swirled. “The odds of you being killed by a terrorist are small,” she said. My heart thudded in my ears. “This isn’t about you,” she persisted. She told me she could no longer travel with her children without them experiencing hate crimes. “You have decided that every Muslim is the enemy. While the Muslim women are left wondering, ‘will my children ever be safe again?”’ she concluded. I flushed, searching for words. I believed that “you” meant Westerners; it was direct, but not personal. I told her I appreciated her honesty and changed the subject. She let me. In retrospect, I suspect she knew I couldn’t answer to this grand accusation. The following January, Charlie Hebdo was attacked. The Western world mourned, shouting “We are not afraid.” The day after the massacre, the headlines read “Revenge attacks…” as mosques came under fire. I read these reports and cried. “She was right,” I whispered to no one. “We have become the monsters.” There was no elaborate vigil for the retaliation. That day, I began to tell stories from Arabia. Je Suis Charlie became the cry, and it stood for freedom of speech. Tout est Pardonné was offered as a choice, that we could forgive. We could have chosen to mourn respectfully, to love beyond the actions of our governments. Instead, too many have chosen to use our freedom to hate. I think of the woman in the mosque often. Did she say those words to everyone? Did she see something in me? Can my stories make her children safer in the Western world? I have been moved to write. And compelled to hope.